Create beautiful everlasting memories with our GENDER NEUTRAL Milestone Baby Blanket Photography backdrop PLUS Two FREE Photo Props! Document the PRECIOUS memories each month of your Baby's first year and watch them grow with our fully customizable infant blanket background. Use the FREE Props Included in the Set & customize with more! give the BEST gift that creates everlasting memories! Note:**This blanket is thin like a sheet making it lightweight and easy to travel with. **Blanket might be creased and left with tiny stains when printing the letters and numbers. The crease and stains will disappear after water washing. Machine wash cold, tumble dry low. If you iron blanket, iron backside and avoid areas with graphics to prevent damage! WE'RE HERE TO HELP! Feel comfortable with your purchase! If you have any issues contact us and we will be sure to make you happy. Limited Lifetime Warranty: If you are not fully satisfied with your purchase for whatever reason we will buy back your item, no questions asked! Click "ADD TO CART" right NOW & order yours today! ✔️ 100% BRAND NEW PREMIUM ULTRA SOFT MATERIAL - Beautifully crafted from super soft quality cotton and polyester fabric material that is comfortable and soft for your baby's sensitive skin. Our photo blankets are designed to prevent wrinkles unlike other cheap milestone blankets, making for the ultimate stunning baby pictures! ✔️AMAZING BABY SHOWER GIFT SET - give the most thoughtful gift set to a new expected mom for her to capture once in a lifetime genuine memories. 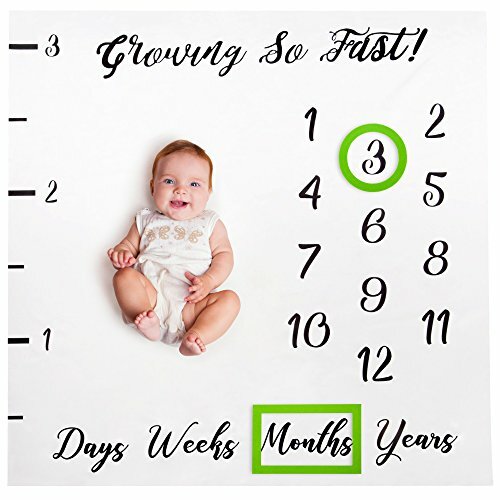 Our milestone photo blanket is a necessity for new moms to show off their baby's monthly growth in a fun way! ✔️ PERFECT SIZE FOR BABIES - 40" x 40" is just the right size for all babies to fit on and capture breathtaking photos with. Set your creativity free and decorate your photo shoot any way you desire! ✔️ LIMITED LIFETIME WARRANTY - backed by our Brulé Limited Lifetime Warranty. If you are not satisfied with your Milestone Baby Blanket, return it for a full refund. If you do not love it we will buy it back from you, no questions asked! ✔️ CAPTURE BEAUTIFUL MEMORIES + FREE BONUS PROPS INCLUDED - create cute heartwarming Gender Neutral photos to document, track and journal each month of your little baby's growth. Perfectly nestle your newborn baby girl or boy on your milestone blanket and use the free bonus number and Month frames included to add a special touch and create priceless everlasting photos. Customize your background photography blanket & share your pictures with friends and family on Facebook or Instagram! If you have any questions about this product by Brulé Gifts, contact us by completing and submitting the form below. If you are looking for a specif part number, please include it with your message.